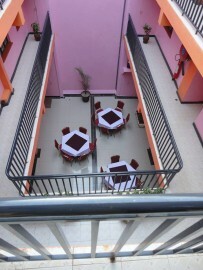 Mountain Breeze hotel is on the Embu-Meru highway about one and a half kilometres from Embu town. It is in a serene and tranquil location targeting the upper market. It is designed in a way that there is a relaxed atomosphere and their services are up to par thus enjoying your stay. Children sharing with 2 adult between the ages of 3-12 years will pay 75% of applicable room rates. Christmas and Easter supplements apply. Accommodation facilities are for all classes of people. 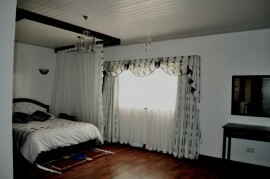 They have the standard rooms, deluxe rooms and executive rooms. The rooms are spacious and modernly furnished with the basic ammenities like a safe, tea making facilities, hot showers, cable tv among others. For the Executive rooms has a private reception, nespapers and snacks. There is also a fully stocked bar and a restaurant that serves fresh hearty meals with no compromise of standards. There is a large conference facility with all the basic ammenities of a business class meeting room with a maximum capacity of 300 depending on the arrangement style. Also for outdoor events like weddings, banqueting and parties can be held in their very beautiful and well manicured gardens which also have practical ammenities.